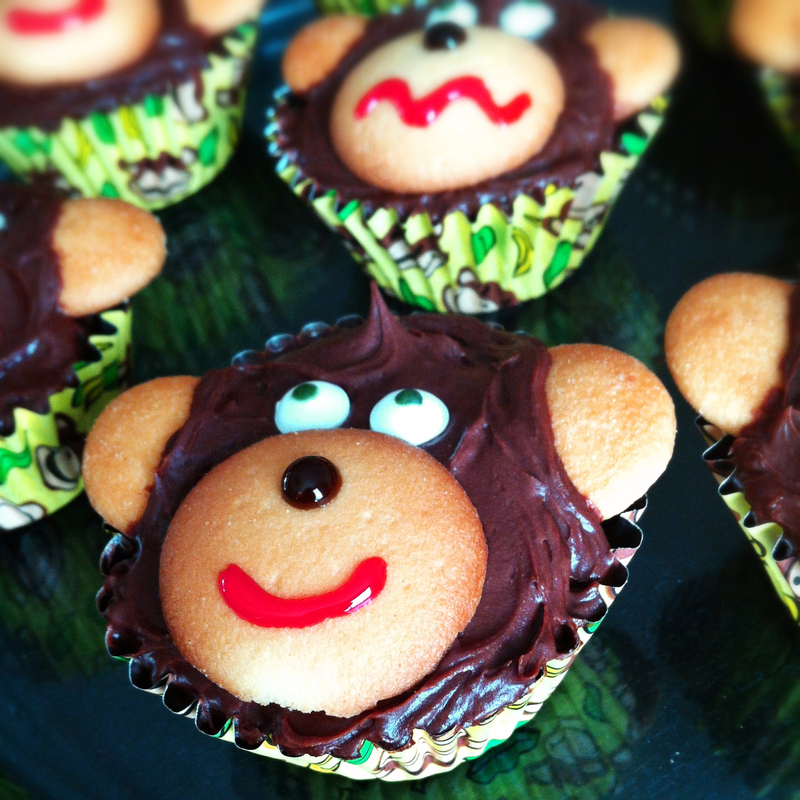 chocolate banana monkey cupcakes | omfg. so good. Yesterday I noticed three very, very ripe bananas hiding under a mango in the old fruit bowl. Did I mention they were very ripe? Picky Eater and I racked our brains deciding what to make with them. 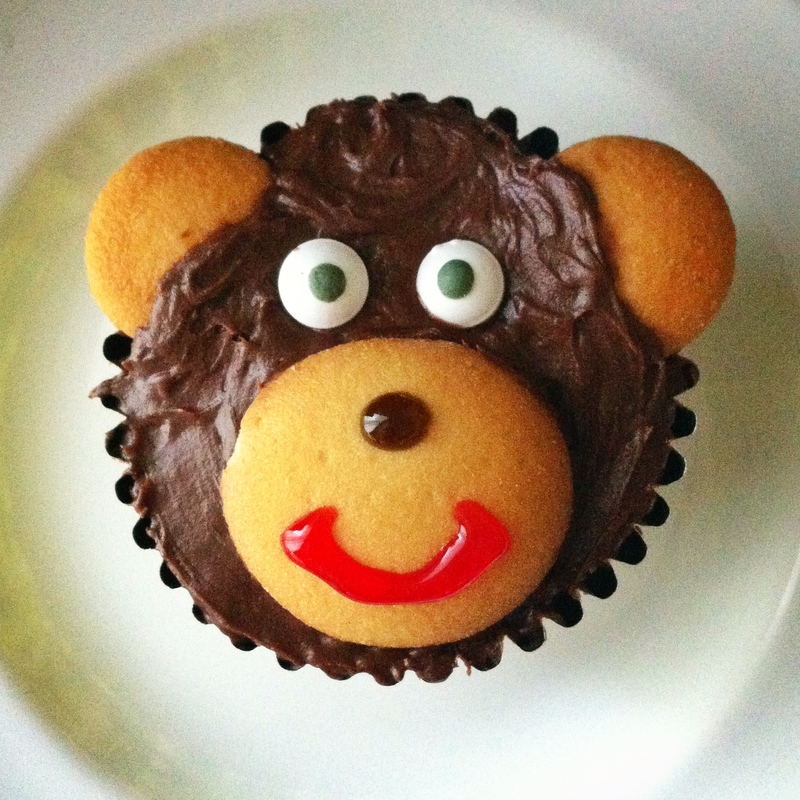 Then I remembered the awesome monkey cupcake liners I snagged at the grocery store over the weekend. Inspiration hit us like a bolt of furry lightening. Chocolate Banana Monkey Cupcakes to be precise. Yes, they’re just as moist and delicious as they look. Preheat oven to 350 degrees. Line cupcake tins with paper liners. In a medium mixing bowl, cream the butter and sugar until light and fluffy then add in the egg, vanilla, sour cream and mashed bananas and stir with a wooden spoon. In a separate bowl, sift together the flour, baking soda and cocoa powder. Add the flour mixture to the banana mixture in two batches stirring just until combined. In a small bowl, sprinkle the remaining tbsp cocoa powder over the chocolate chips and toss to coat. This will keep the chips from settling to the bottom of the cupcakes while baking. Add the chips to the batter and gently stir until just combined. Spoon into cupcake liners (around 2/3 full) and bake in preheated oven for 25 – 30 minutes or until they bounce back to a light touch. 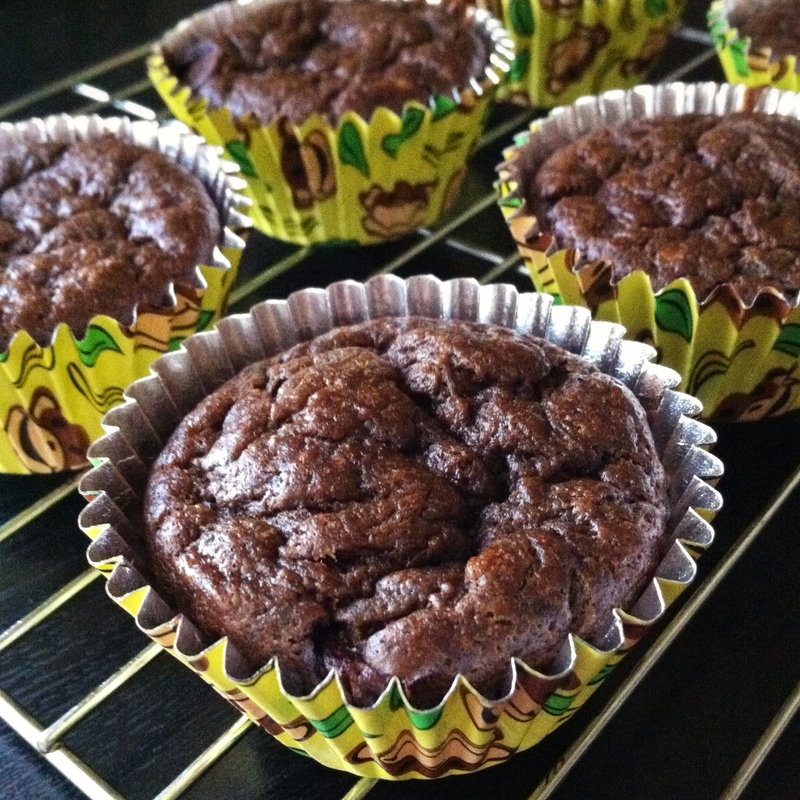 These cupcakes have a consistency similar to banana bread so they won’t rise like a typical cupcake. So don’t freak out. In a medium bowl, cream butter until smooth then slowly sift in powdered sugar and cocoa powder. Add in vanilla and heavy cream and mix until smooth and creamy. These are pretty easy to assemble. Dab a little chocolate frosting on the back side of each of the mini wafer ‘ears’ and stick them to the cupcake. Frost over half of the ears and the rest of the cupcake with chocolate buttercream. Place the larger wafer in the ‘muzzle’ area. Add eyeballs and draw goofy mouths and noses on the muzzles. Don’t you just want to eat his cute little monkey face right up? Do it, he won’t bite.